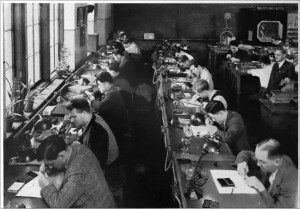 Central Technical School has been known for its unique training programs throughout its history. Above, students in 1948 take a watchmaking class, the only one of its kind in Canada. Central Technical School, or “Tech” as it is known to staff, students, and alumni, has always played a unique role in Toronto’s public education system. When then-prime minister Robert Borden laid its cornerstone on Sept. 3, 1913, Tech was well on its way to becoming the largest technical educational institution in the British Empire. Paid for solely by the citizens of Toronto, whose elected officials recognized that a modern city in an industrial age needed skilled labour to be successful, the school has prepared generations of students for careers in everything from visual arts to sports to skilled trades. Now, a little over a century later, Tech’s alumni are not only preparing to celebrate that legacy, but are also raising money to ensure that it lasts well into the future. Homatidis, who graduated in 1966, was a student at the school during its 50th anniversary, and has fond memories of his time there. He also speaks highly of the education he received. “I went to engineering at [the University of Toronto], and some of the equipment we had in our chem lab [at Tech] was comparable to or better than [what we had] at U of T,” he said. Ecclestone-McCurray, who was a student at the school from 1987 to 1989, said that “graphic design and the things I learned [at Tech] helped with the discipline and art of design that you need in interior design”, her current profession. The school’s connection to the art world goes back decades. Lawren Harris, a member of the Group of Seven, attended the school, and even came back to teach there. Ecclestone-McCurray’s grandmother was one of his lucky students, and was also taught by Arthur Lismer. “Central Tech has a fantastic art program that is equivalent to an [Ontario College of Art and Design] experience,” explained the CTSAA president. She described the school as a “respectful space”, where students always exhibited a “very helpful spirit”, something that, to her mind, remains the same. “We were like that when I was there, and it is nice to see that that has not changed,” Ecclestone-McCurray said. “It was just such a wonderfully supportive place,” said retired teacher Ellen Michelson. She taught a variety of subjects during her nearly 15-year tenure at the school, but for her, a critical part of the curriculum was helping students realize that they had the capacity to achieve great things. Michelson, who “loved teaching at Tech”, developed a rapport with her students. Such diversity becomes apparent when one makes a cursory review of notable alumni: there are the expected football players and athletes like Olympic decathlete Michael Smith and boxer George Chuvalo, as well as artists Doris McCarthy, Lawren Harris, and Bruno Bobak, but there are also physicist Leon Katz, producer Sidney Newman, and political cartoonist Terry Mosher. Central Technical School will celebrate its 100th anniversary with an open house and several events over the Oct. 16 weekend. For further information, or to make a donation, please visit www.ctsalumni.com. Fantastic school!! The education I received there opened every door I knocked on after graduating in 1960.